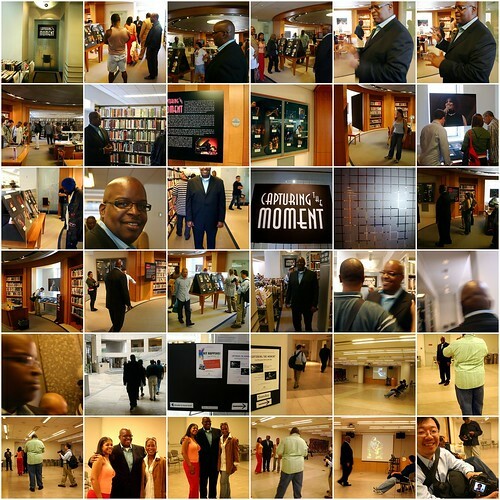 The Capturing The Moment Opening Reception was very nice and well attended. Big thanks to Stewart and everyone at the library for making it a success. Warm hearted thanks to my family and friends for their love and support. Special thanks also to Clairdee for introducing me and to Terrence Brewer and Brandon Essex for providing the music. This day was definitely the realization of a dream come true for me. Last June, I was shooting the ReNew Orleans Jazz Festival at the Berkeley Public Library and imagined having my photos displayed there. A couple of months later, I met for dinner with my friend Stewart to further discuss the idea. The San Francisco Public Library provides great opportunities for local artists to exhibit their work. After our discussion, the question became “2006 or 2007?” I chose 2007 which provided me with a very interesting challenge. I knew there were photos in my collection that I wanted to include in the exhibit but when you are preparing for an upcoming exhibit, you want to build your collection even more. I selected from about 20,000 photos for this exhibit. I initially selected a set of almost 500 photos. I wanted to make sure I included every festival and concert that I had photographed then I narrowed it down to 50 photos for the exhibit. I am very pleased with the end result especially the spectacular job the library did of arranging the photos for the exhibit. I was also very excited that the opening reception occurred on Father’s Day as it gave me the opportunity to honor the legacy of my father, Ritson Knox. He greatly influenced my love of music and photography. If you missed the opening reception, not too worry, the exhibit runs through August 16. Special thanks to everyone for sharing their photos from the opening reception. More photos to come so please check back often. George Kelly provided the photos for the mosaic. This entry was posted on Tuesday, June 19th, 2007 at 4:37 pm. It is filed under Special Feature. You can follow any responses to this entry through the RSS 2.0 feed.